Madonna didn't show up for Alex Rodriguez's All-Star bash in the Big Apple on Monday night -- but rumors of a romance have not cooled. Madge's BFF Ingrid Casares showed up -- igniting more talk of a not-so-platonic friendship between the slugger and the Material Girl. The NY Post says the Madonna was slated to appear at the event, held at Jay-Z's swanky 40/40 Club, but she never appeared. Instead, Alex chatted with Casares -- and she was spotted leaving his Park Avenue place yesterday. The slugger may need some support -- the Post says his Yankee teammates are giving him the cold shoulder because he's become a "huge distraction" since reports saying he's thisclose to Madge. 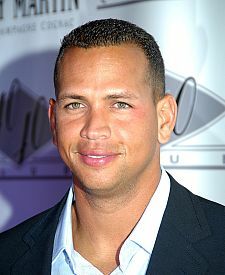 A-Rod was reportedly the only Yank at the party.